A jam is a jam is a jam, right? Perhaps, but there are little tips and tricks that can take an ordinary jam to new heights. Shakirah is a Master Food Preserver and studied preserving at the University of Gastronomic Sciences in Italy, so we always pick up a trick or two from her. For stone fruit specifically (that is, apricots, peaches, and nectarines), she likes to cook the fruit a bit first before adding sugar. As the fruit heats, it opens up and becomes more receptive to the sugar. Then when the sugar dissolves into the liquid to become a syrup, it penetrates the fruit more easily and you reach a better set, even with relatively low sugar levels. Normally, we macerate fruit in advance of making a jam—in other words, allow the fruit and sugar to stand together to draw out liquid—but this method works out to be simpler and faster. Before long, the jam was perfectly viscous and dense. A splash of lemon juice adds some brightness and protects color. This is key especially for lower-sugar preserves, which can lose their luster more rapidly. For this jam, use only 30 percent sugar to fruit by weight, about as low as you can go and get a proper set. This method works as well on nectarines as on peaches and apricots, but the nectarine flavor really shines here. It's sure to be a welcome dose of summer sun when the days grow colder and dark. Wash and dice the nectarines, discarding the pits. 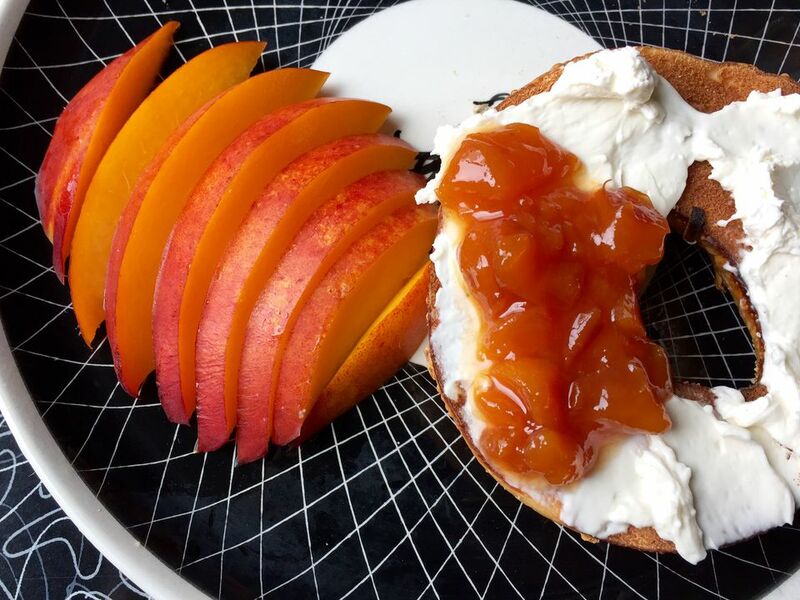 You do not need to peel the nectarines. Weigh out 5 pounds of the fruit. Add it to a heavy, non-reactive pot. Add a small amount of water to the bottom, and place the pot over medium-high heat. Bring to a boil, stirring to prevent scorching. The fruit will give off quite a bit of liquid. Boil for a few minutes, until the fruit begins to look translucent. Add the sugar, and stir to blend completely. Return to a boil, and cook, stirring occasionally, until the jam reaches the set point. Add the lemon juice and stir to combine. Pack the jam into clean half-pint jars. Seal and process for 10 minutes in a water bath canner.